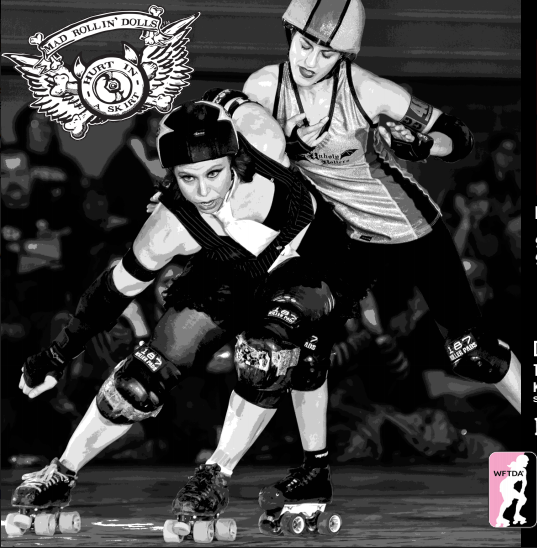 Mad Rollin’ Dolls present “LICENSED TO SPILL” on Saturday, December 10 at the Alliant Energy Center’s Exhibition Halls, where the four home teams will meet to in fierce, fun competition to see how this season’s rankings and rivalries shake out. In the first game of the evening, the Unholy Rollers will challenge last season’s champion Quad Squad to a battle of the superheroes vs. the queens of darkness! The second match of the night features the wiles of the Vaudeville Vixens against the skate crime syndicate of the Reservoir Dolls. Doors open at 5 p.m. and the first game begins at 6 p.m. – with halftime entertainment from Madison’s own Little Dribblers girls basketball team! Tickets are $10 one week in advance if bought at one of our ticket outlets in Madison: Willy St. Co-op (all locations), Pegasus Games, and 608 Skate (inside Fast Forward Skate Center). Online ticket pre-sales are $12 for adults, $6 for children 6-11 (under 6 are always FREE) – http://www.isthmustickets.com/events/39015321/mad-rollin-dolls-season-13-game-1-licensed-to-spill – Tickets at the door are $15. New this year: Military, senior (55+), student discount at the door with valid ID; price at door $12 (regular $15). A portion of the proceeds from this bout will go to benefit the Northside Planning Council.